Standoff 2 is a brand new first-person shooter (FPS) game that offers fun and excitement for all players who love defense and adventure. The concept will interest you in ways more than one. Needless to say, the incredible action will keep you glued to the screen for hours. Standoff 2 offers an incredible online confrontation of terrorists and counter-terrorists. It does not matter whether you prefer storm trooper, sniper or stealth operation because the game is jam-packed with everything. If you choose to download Standoff 2 for PC, you will enjoy the game on a whole new level, there is no doubt about that! Standoff 2 will throw you into a battlefield where you will have to do everything that you can to survive. You will be able to show off your skills by participating in the death match, capture the flag and go into duels to show your supremacy. You have to be prepared to also partake in competitive actions such as diffusing the bomb and arms race. There are very many enjoyable aspects of the game. You will not be disappointed! You are required to defeat enemies using a number of modern weapons that the game will provide for you. As such, you will be required to fight as a Special Forces soldier and anti-terrorist unit soldier. Standoff 2 offers an interesting perspective when it comes to ensuring that your character is dressed accordingly and has all of the necessary set of weapons. All you have to do is ensure that you defeat as many enemies as you can. Download Standoff 2 for PC in order to equally enjoy everything that the game has to offer. 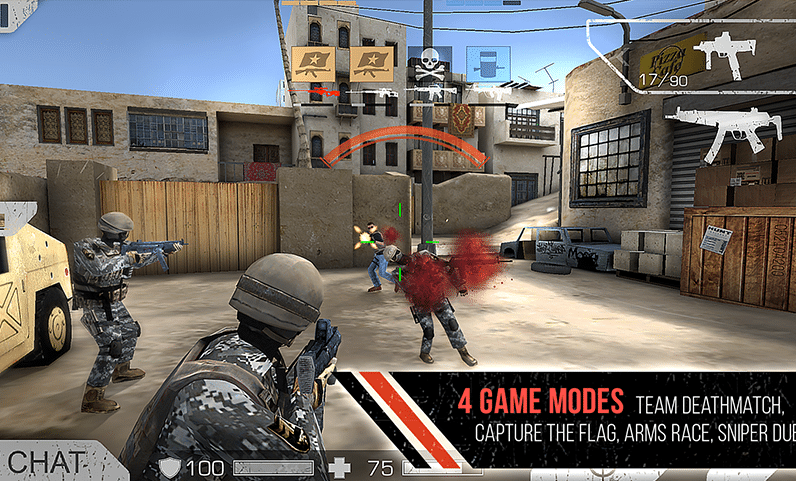 · If you are the kind of player who loves ambush and invade locations then the terrorist option is the best for you. However, if you prefer camping and tactical playing, a counter terrorist is the perfect character for you. The best aspect of the game is that it offers a number of characters for you to choose from. · Carefully maneuver the joystick and fire shooting button at the bottom left corner and right corner s of your screen respectively. This way, you will be able to be in better control of the game. · Always change your weapon according to the map. This is because some maps may have longer weapons for a more improved bullet shot. However, other weapons may be shorter. However, you have a variety of options to choose from. · Do not rely on a single method to complete every mission. Change up your style and use all of the several techniques that are available to fight and conquer. · Upgrade as much as you can to get better weapons. The more you play and win, the more you will get an opportunity to level up and use the best weapons that are available.